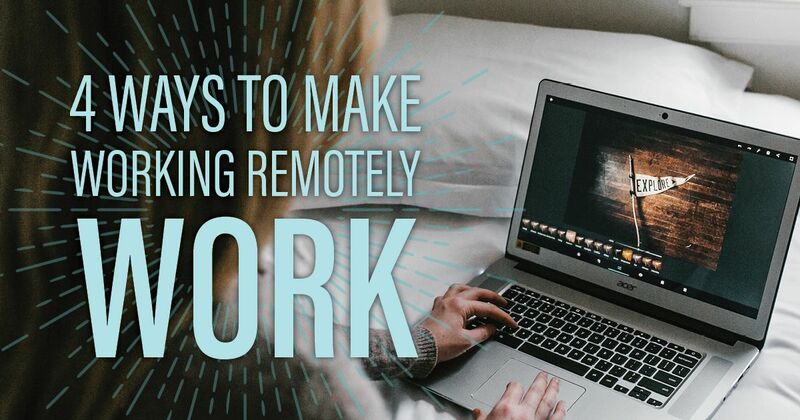 With an influx of technology allowing us to stay connected to the office all the time, working remotely has become easier than ever. No longer do we have to be in the office to answer calls, join meetings, or even collaborate on documents or spreadsheets. Working remotely is sometimes viewed as generational—but it isn’t something only Millennials are looking for. Baby Boomers are also seeking ways to make a living while having some flexibility in their schedules. New parents want to be at home more, but still need to earn a paycheck and desire the interaction of working on a team. At LMD, we offer our employees the flexibility to work remotely when necessary—no complaints here. But how do we provide this benefit while maintaining productivity? We’ve tested and tweaked our processes and procedures—and continue to fine-tune our policy as we discover what works and what doesn’t. All in all, we’ve seen a positive impact on the business and a boost in morale among employees. Take advantage of the latest technology tools for communication to reach out frequently and respond quickly when working remotely. This reinforces that you are a hands-on team player, regardless of where you are. Slack is LMD’s online collaboration/communication tool of choice. Quick Q&As with co-workers, even when working in the office, are less intrusive with Slack. Slack also offers integrations with other apps (such as Asana and Dropbox), in-app screensharing, and video and voice calling for when your problem needs more than a quick chat to solve. You can even use emojis and GIFs on Slack (which can speak volumes in a split second vs. a long-winded discussion). One of the biggest benefits of working from home? Using time more effectively. When you would normally be commuting, you can check some to-dos off your list early in the day, start a project in peace and quiet, run an errand before the workday starts, or grab a few extra minutes of sleep. However, you should still keep a regular work-from-home schedule and similar hours as your co-workers. Let’s face it—we may not like keeping to someone else’s schedule, but standardized schedules keep us all on track. Reading body language has always been one of the greatest benefits of a face-to-face meeting and the biggest thing lacking from phone calls and online chats. Add Zoom to Slack and you can interact with your co-workers in the office and those who are also working remotely. Video conferencing can reinforce the feeling of you and your co-workers working together. Zoom even has a “touch up my appearance” filter for those early morning meetings (however, it can’t mask the fact you might still be in your pajamas). Conventionally, a “good” employee is defined as someone who shows up on time, is dressed to impress, and puts in long hours at the office. Working remotely eliminates most conventional measures of a “good” employee and allows you to focus on productivity and being responsive to colleagues and customers. In one word: results. Timely deliverables and high-quality work are goals for all employees but especially for remote workers, yet time management can be tough for anyone, regardless of where you’re working from. Consider time management training for yourself and your organization. If your organization doesn’t have a remote work policy, now may be the time to consider one. But whether working in the office, remotely, or some of both, all these ideas can increase communication, organization, productivity, and morale.